Fiction – paperback; Black Swan; 240 pages; 2017. Shane Connaughton is probably best known as the co-writer of the screenplay for the film My Left Foot for which he was nominated for an Academy Award in 1989. He’s also an actor, who has appeared in a wide range of films and TV dramas, including Coronation Street and Neil Jordan’s The Miracle. 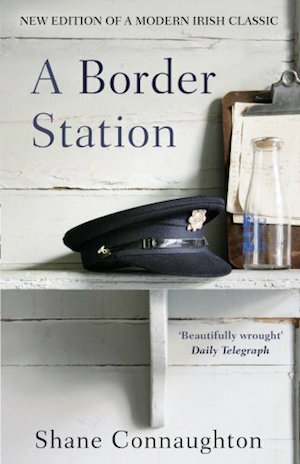 A Border Station, his fiction debut, was shortlisted for the Guinness Peat Aviation Book Award upon publication in 1989. It has recently been republished by Black Swan to tie in with the sequel, Married Quarters, which came out earlier this year (and which I bought in Dublin in the summer and am now looking forward to reading very much). It’s a beautiful and eloquent book set in the 1950s that follows the day-to-day dramas of a young boy growing up in rural Ireland in a remote house, attached to a police barracks, that has no electricity, no running water. We never find out the boy’s name, nor do we find out his age, but we do know his father is a fierce, bad-tempered man, a police sergeant at a Garda station on the border between the Six Counties and the Republic of Ireland. We also know he thinks the world of his mother, a good-looking, mild-mannered woman, with whom he shares a bed, and he loves to spend his time outdoors, exploring the rolling green hills and country lanes by bicycle despite the often miserable weather. As often as he could, he escaped from the barracks to roam the drumlin fields or sit with the farmers in hedge or house until the rain had stopped. There was water everywhere. In the sky, in the lakes, in the light; running off the hills, off the trees, off the roofs and cornered into barrels; in the lime-bottomed well, in the village pump, in the rain gauge at the rear of the Station, always in the air and constantly on tap in women’s eyes and children’s hearts. ‘They’re born with water in their veins instead of blood,’ his father said. Bucketing rain they called ‘A damp class of a day’. The story, which is supposedly based on Connaughton’s own childhood, unfolds in seven interlinked chapters or — whisper it — short stories. There’s no real plot, instead we get a series of vignettes focusing on the boy’s home life. There’s nothing about school, little about friends; his world essentially revolves around his parents: the mother he idealises; the father he fears. Because it’s written from a small boy’s point of view, the reader comprehends more than the child himself. We see that there are problems between his parents in the “bedroom department”; that his dad does not necessarily wield his power in a fair way; that he is prejudiced against Protestants or those that live over the border; that it may, in fact, be inappropriate for the boy to share a bed with his mother. And it is this gap between a child’s naivety and the real world that makes A Border Station so deeply moving: it’s completely unsentimental, but is infused with a lingering sense of sadness, of people’s potential being thwarted by circumstance, religion and bad behaviour. But it’s not all doom and gloom. There are some terrific set pieces, some of which are ripe with black humour. The chapter entitled Beatrice is actually laugh-out-loud funny — the boy’s father deliberately chops down a tree he shouldn’t chop down on the neighbouring demesne owned by Lady Sarah Butler-Coote, an octogenarian Protestant spinster, and then pretends it is an accident. It’s tinged with sadness and a deep sense of injustice though, for the boy is blamed — and he saw it coming but is too young to do anything about it. All in all, A Border Station is written with an almost unbearable ring of authenticity, nicely balanced with empathy, pathos and a good sense of humour. Reminiscent of the late great John McGahern, this is a truly lovely read. I can’t wait to crack open the sequel. I immediately thought of McGahern’s The Barracks as soon as I saw this! (That’s the one you gave me). There are definite similarities, not least the boy’s love for his mother, his fear of his father and the Garda station setting. Fathers aren’t represented kindly in Irish literature, it seems to me. Really like Ireland as a setting for books, and the book sounds great, thanks. He was a new name to me, too. I discovered his books in Hodges Figgis in Dublin, possibly my favourite bookshop in the whole world because it has an entire wall of Irish literary fiction and I always discover a few new gems when I visit. It sounds good though I’m not a huge fan of child narrators as a rule. Have you read much other Connaughton? The 1950s seems a popular period for Irish fiction, or is that just a false impression I’ve picked up somehow? It’s told in third person, so not a child narrator as such; you basically just see things from his POV. I guess the 50s is popular because it was the height of the Catholic Churches rule over the Republic: they controlled schools and every facet of people’s lives and such conditions were oppressive, leading to all kinds of social/economic/political/sexual tensions: perfect fodder for fiction. I think I like reading about this era because of the two faces everyone seemed to have: the holy public face and the secret private face. Terrific review. Sounds like a book I would so enjoy. Missed it first time around. Not this time. Thanks for your comment. (Sorry, the blog’s taken a bit of a back seat lately so only just seen your comment.) This is certainly a great book and I really look forward to reading the follow up shortly.